Sheherazade (Op. 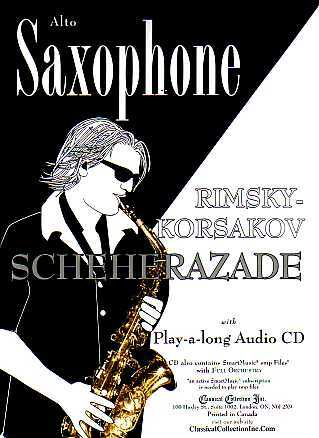 35) is presented as a Solo for Flute, Clarinet or Alto Saxophone with a play-a-long Audio CD which also contains SmartMusic SMP Files. 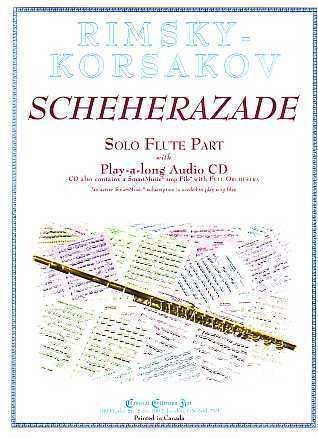 This edition of Sheherazade is ideal for anyone who is studying or listening, to better understand and, in general, enjoy the wonderful music of this outstanding piece! Nicolai Rimsky-Korsakov, Russian composer, was born on March 18, 1844 in Tikhirin and died on June 21, 1908 in Lyunensk. He was one of the Russian Five: Mily Balakirev ((1837-1910), César Cui (1835-1918), Modest Mussorgsky (1839-1888) and Alexander Borodin (1833-1887). He began piano lessons at age 6 and was inspired by the music of Russian composer Michail Glinka (1804-1857). Through his piano teacher Théodor Canille, he met Balakirev, Cui and Mussorgsky in 1859. Rimsky-Korsakov was from a distinguished Military and Naval family, graduating from the Naval Academy in 1862. In order to allow him to continue his musical activities, he was appointed “Inspector of Naval Bands” in 1873, a post which had been created specifically for him and was abolished when he left it in 1884. Rimsky-Korsakov composed a wide variety of music: 15 Operas, including The Snow Maiden (1880), Mozart and Salieri (1897), The Tsar’s Bride (1898) and The Golden Cockerel (1906). However, the two most famous melodies from his Operas are best known instrumentally: Flight of the Bumblebee from the end of Act 3 of the opera The Tale of Tsar Saltan (1899-1900) and Song of India from the opera Sadka (1867), which, although a vocal aria, became an instrumental big band “hit” in 1938 for Trombonist Tommy Dorsey (1905-1956). 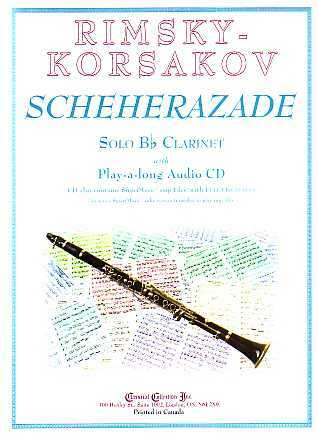 Although he wrote 4 Symphonies, Rimsky-Korsakov’s best known orchestral works are: Capriccio Espagnol (1887), Russian Easter Overture (1888) and, of course, Scheherazade (1888). The 4th movement has four main sections and a Coda: beginning (similar to the 1st movement): Festival at Bagdad (38-497); The Sea (498-587); The Vessel Is Wrecked On A Rock Surmounted By A Bronze Warrior (588-630) and Coda (631-667). Both Scheherazade and the Sultan have their own “themes”, which Rimsky-Korsakov quite rightly refused to call leitmotifs - a technique used by Richard Wagner (1813-1883) in his 4 Operas in Der Ring des Nibelungen to help identify the large number of characters. In Scheherazade, the Sultan’s theme (the opening measures) and Scheherazade’s theme (the Solo Violin) both appear in several of the movements but they change through the course of the work. The best example of change is comparing how the Sultan’s theme is played in the opening (bars 1-4) then, in the same meter with the same pitches, over 1500 bars later at the end of the 4th movement (647-656), followed by Scheherazade, of course, having the last word. In this arrangement the 3rd movement is in the original key but to make for “more friendly” key signatures, movements 1, 2 & 4 have been transposed up a semi tone.